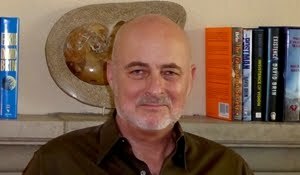 David Brin, pictured above, has been named one of the "world's four best futurists" by Urban Developer Magazine. If you click this link, you can find out more, and learn about Brin's latest books. On his website, in the calendar section, you might also note that Brin will be speaking at the Crown College graduation ceremonies, at UCSC, at 9:00 a.m. on Sunday, June 16th. That is two days from now. If you are local, and can figure out how to get up to the campus, since I think that parking up there will be pretty tight, you can hear what Brin has to say for free. You won't have to pay any of those fancy "futurist" fees. 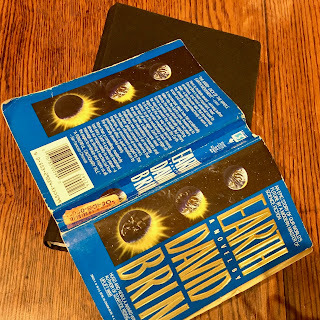 I have almost finished one of Brin's earliest novels, Earth, published in 1991. So far, Brin's book is making a pretty good case for the Gaia hypothesis. Maybe Adam Frank has been reading Brin, too. Frank is a physicist and an astronomer, and his column, in the June 13, 2018, edition of The New York Times is headlined as follows: "Earth Will Survive. We May Not." I am looking forward to finding out whether or not Brin agrees. If he does, that graduation speech on Sunday could be pretty depressing: "Hello, graduates! Welcome to the world. We're doomed!" It's not dark yet, but it's getting there! Please give us a review once you've heard him speak! Why is it depressing that the earth will survive even as the human race does not? I find that hopefully. Maybe evolution can come up with something better? Buses run all day, every day, from downtown up the hill to UCSC.